Why should a professional incorporate their practice-business: Introduction to factors for consideration. I am frequently approached by clients who are professionals (Realtors, doctors, dentists, physiotherapists, optometrists, etc.) or have a business and are looking to incorporate and need advice. There are a number of advantages and disadvantages of incorporation that must be considered prior to determining the appropriate business structure with which to move forward. 1. If you are a professional, whether your professional association will allow you to incorporate and if so, what restrictions the association may place on the corporation. 2. Incorporation creates a separate legal entity, which has all the rights and obligations under the law as a natural person. Among other things it can acquire assets, be the subject of litigation and enter into contracts. This can be a benefit to you as the corporation can enter into a lease to occupy space, or can borrow money, thus if the agreements are breached, it is the corporation that will be liable for the damages. However, in actual practice it is not unusual to see a personal guarantee required by an individual on behalf of the corporation. 3. A corporation allows the shareholders of the corporation to have limited liability. The shareholders liability is typically limited to the amount that they have agreed to pay for their shares. However, again this may offer less protection than anticipated if personal guarantees have been required and provided. 4. The ownership of the corporation can be altered through the transfer of shares. This not only allows for the efficient transfer of ownership, but also potentially allows for the corporation to raise capital through the sale of shares. 5. In my practice, the most common reason for incorporation is the tax benefits that may be achieved through tax deferral, dividends and income splitting. I recommend that you discuss incorporation with your accountant to determine whether incorporation would provide you with income tax advantages. · Incorporation and the operation of small businesses. He also advises clients on corporate commercial matters including incorporation, employment dispute, property transactions and other related issues. Christian also has extensive experience in creditor and debtor remedies including foreclosure. 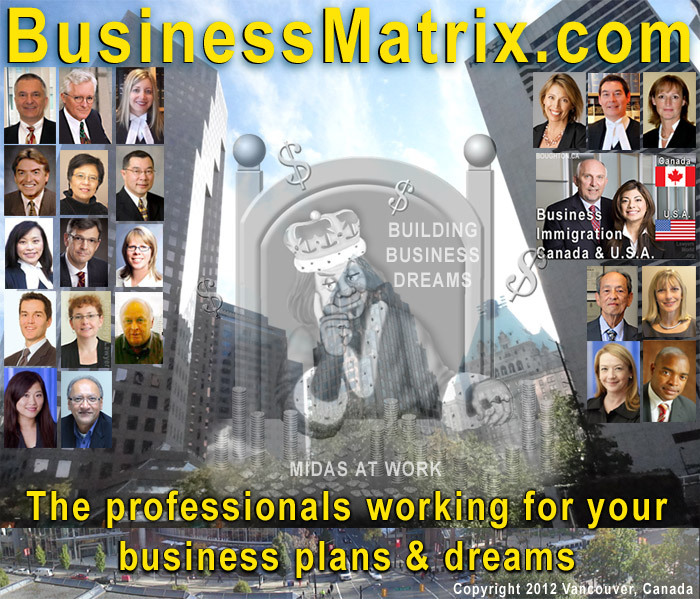 BusinessMatrix.com is a cooperative venture of a group of business lawyers, business consultants and accountants, with backgrounds in: business ventures development, business immigration, trademarks, patents, copyright, product liability, professional negligence, shareholder mediation, employment & labour law, and defense of complex tax evasion charges. etc. This site has been developed with the micro-business, small business, entrepreneur, and business ventures development person in mind. The professionals referenced have an average of over 25 years of experience in working with business startups and development. They range in backgrounds from law (barristers & solicitors), accounting (e.g. CA & CGA ), administration ( MBAs & executive coaches) , graphic design and information technology (e.g. librarians, library technicians, cartographers). Copyright © 2014 all content and images provided by contributing writers, graphics illustrators, designers, cartographers photographers, lawyers, accountants, business administration consultants, etc. NB. special thanks is given to Ms. Cat Wong, in San Francisco for contributing the graphic of King Midas used in our first main graphic collage. Ms. Wong is an experienced children's illustrator, see claraandclarencebear.com and currently developing Apple and Microsoft e-book apps for children. The intent of the Midas graphic is to bring some humor to this site, as the professionals work with so many entrepreneurs with dreams and fantasies that need to be translated into functional business operation plans. Article: Employment Law for Employers "Reasons to Call Your Employment Lawyer Before You Think You Need Them"
What is "Business Immigration" ?